Filtering is the act of overtaking slow-moving or stationary traffic by travelling between lanes and, despite causing scowls and abuse from many car owners, it’s completely legal as long as it is done safely. 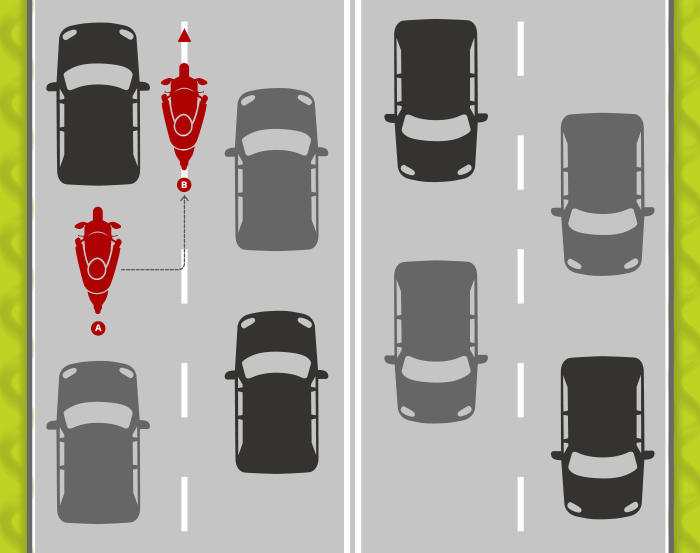 There are lots of different names for filtering, including lane-splitting and white-lining, but what isn’t up for debate is why motorcyclists do it – to avoid congestion. One of the many reasons we ride motorcycles is the fact that you can avoid congestion on two wheels much easier than you can on four – thanks to filtering. Like most things in UK motoring law, whether it’s illegal or not is in the eye of the beholder, the beholder in this case being the police. Filtering, as an act, is legal and if you do it safely the police should not stop you. Filtering in an unsafe manner is illegal, however that very much depends on the speed of the traffic you are filtering past and the speed at which you pass them. Filtering is also illegal in a no overtaking zone. Things get a little more complicated when you approach a crossing with zig-zags. Here filtering is illegal if you filter past a moving vehicle that is closest to a crossing, or the stationary vehicle that is closest to the crossing. Essentially this means it is legal to filter past queuing traffic on the approach to a crossing, but not the vehicle that is closest to the crossing, whether it has stopped to allow passengers to cross or is moving through the crossing. For an outline of the rules, see the useful comment from Graham beneath this post. There is a school of thought that says filtering is safe as long as the traffic you are overtaking is travelling at no more than 20mph and you are overtaking them at no more than an additional 20mph. This rule will cap filtering speeds at 40mph and it is thought that the police will not intervene with anyone filtering at that speed. Again, however, it is worth stressing that this is a school of thought rather than a hard and fast rule. If a police officer determines that you are filtering unsafely, carelessly or too quickly, you could still be stopped, even if you haven’t broached the 40mph limit. To filter safely is not to simply avoid police attention but to move through slow-moving or stationary traffic with minimal risk. This means you need to weigh up whether it is safe to filter and at what speed to minimise risk and maximise your progression. Filtering safely is logical and, the faster you filter, the less time you or other road users have to react to you. By filtering past slow-moving or stationary traffic, you will make time gains even at low speeds. To filter past faster moving traffic means we ourselves must up our speed and therefore the risk because lane-changing is more frequent at higher speeds. As such, it is the speed of other traffic that should determine whether we filter or not, rather than the potential time gains. When is filtering most risky? We’ve all been there, when you see a queue forming you dart across lanes to find what you believe is the line of least resistance. And that’s why you are at most risk filtering when traffic queues begin or come to an end. Similarly, when a queue disperses, it’s similar to being on the start grid of a race as everyone moves off quickly and into the lane they believ e will gain them the most distance quickest. As a result, it’s important to resist the temptation to filter as soon as a queue starts to form. Instead, you should wait for the lane-swapping to settle down and everybody’s speed to slow down before beginning to filter. Similarly, try to rejoin traffic before a queue breaks up completely. This applies when approaching junctions, roundabouts and traffic lights, too. Don’t get too greedy – it’s tempting to go past one more car until you’re at the front of a queue but it is here that most lane-swapping will begin again – putting you in danger. What if I have an accident when I’m filtering? If you have an accident whilst filtering, your rights are slightly clouded when it comes to most insurance policies. Generally insurance brokers do not make reference to filtering in their policies and that means it’s never clear what might happen if you make a claim on an accident that occurred while you were filtering. As a legal act, it should be covered in your insurance policy and you should be able to make a successful claim on your insurance policy. If however you were to hit a car turning into the oncoming lane head-on, whilst filtering, you would be fully liable. If you are deemed to have hit another car because the gap you were attempting to pass through was too narrow, you would also be fully liable. Image courtesy of Nathan Bittinger via Creative Commons, it has been adapted for this post. If you are talking about the traffic lights image. Those lights are in London…. 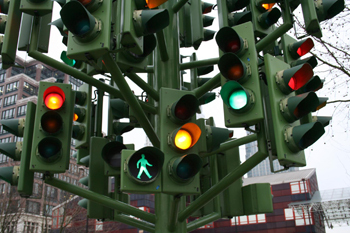 read more If you are talking about the traffic lights image. Those lights are in London. (b)to pass ahead of the foremost part of a vehicle which is stationary for the purpose of complying with regulation 23, 25 or 26. (b)the reference to a stationary vehicle is, in a case where more than one vehicle is stationary in a controlled area for the purpose of complying with regulation 23, 25 or 26, a reference to the stationary vehicle nearest the crossing. So it is only illegal to filter past the *moving* vehicle nearest to the crossing or the stationary vehicle nearest to the crossing *which has stopped* to give priority to a pedestrian using the crossing. I would like to thank the editor of this article for using pictures from the U.S about a U.K. issue, very well done!… read more I would like to thank the editor of this article for using pictures from the U.S about a U.K. issue, very well done!